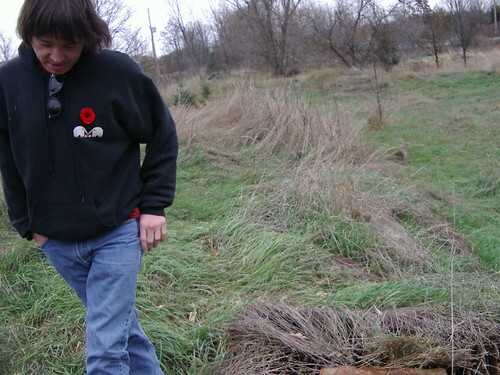 This photo is of Keith, my friend who came to Ontario with me and my cat Grinder after my mother passed away. We were packing their pottery for a donation to a gallery that would take place in the spring. We also were packing the house to ship to BC. It was a sad and yet glorious time. This picture was taken at my Nana and Grandpa's farm outside of Verona Ontario. Keith is wearing his poppy. Growing up in Canada, I had a poppy every year for Remembrance Day and it all seemed very traditional. Over the years I sometimes bought poppies and sometimes not. When I first met Keith, and the first Nov 11 came near, he not only insisted on buying us poppies but we wore them on everything when we went out. He said it was important. 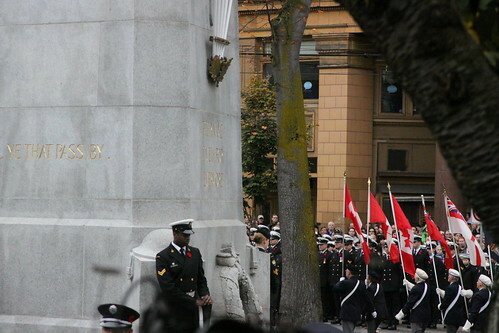 I had gone to some of the Nov 11 gatherings at the cenotaph but we never missed one over the years. Keith used to remind me to bring tissues 'because you always cry.' Miss him. Well yesterday was the 1st poppies I saw for sale (donation) so I bought one and the seller pinned on my jacket. There is some crap about not wearing one this year, you can look that up if you want, I really can not be bothered to do that. Here is a photo in my kitchen with the poppy on my coat, to be worn proudly and with gratitude.